When my plans involve going to a themed party, I always try my best to be spirited and contribute to the fun as much as possible. So, when I found out we were having a "White Out" party at work last week, I knew I wanted to rock whatever white I could find. As basic as white can be, I found it quite hard to find anything solid white except my go-to blazer, so I ended up doing a little mixing and matching of black and white, all while achieving the goal I'd say! 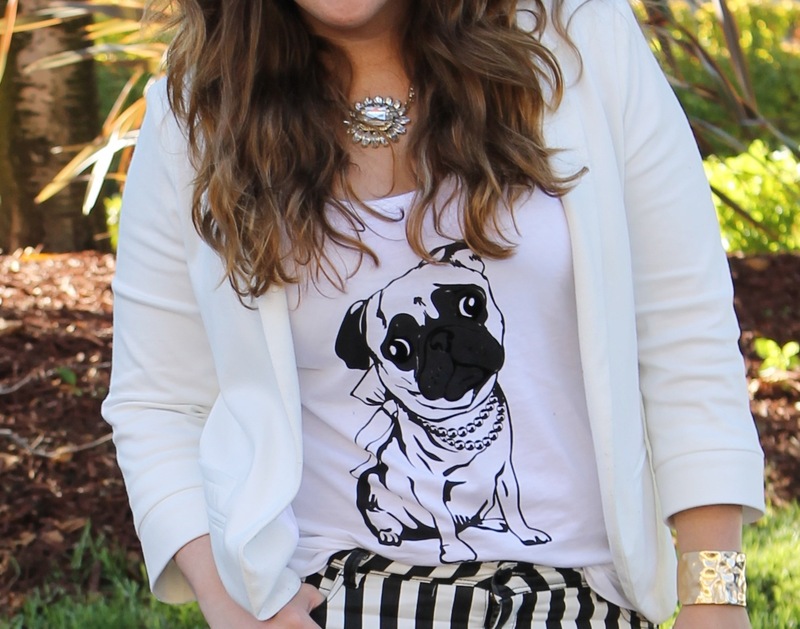 I'd been waiting to wear these striped pants and pug tank for a few weeks now, and it just worked out perfectly to wear them together for this occasion. Side note on this tank-- I scored it for $5.00 on CottonOn.com--is it not just the cutest? I'm a sucker with anything dog related so it was a no brainer.